It’s kind of hard these days to not to notice that California is in year 4 of severe drought. Lawns are getting browner, reservoirs are getting shallower, and my wife still isn’t buying my failure to wash her car as “conscientious water conservation.” Everything and everybody is struggling in one way or another as we march on through the dog days of Summer, praying for the El Nino to come and flood the living crap out of us. As divers, we can feel safe knowing that our watery ocean playground is safe but what about the estuaries and wetlands bordering our coastline? With over 90% of Southern California’s coastal wetlands already lost to development and other man-made concerns, we can’t afford to lose more. Last night at the G2 Gallery in Venice, concerned citizens checked in with local scientists for the latest word on how these unique and critical ecosystems are faring. The highlight of the evening was provided by Brenton Spies, a scientist working out of the Jacobs’ Lab at UCLA. Working on the impact physical processes can have on water quality, community structure, and the presence/absence of endangered fauna, Brenton’s studies have taken him to all of the approximately 375 various wetlands in California. In particular, Spies uses the tidewater goby, a particularly tough and adaptive species, as the vehicle by which he helps explain his journey up and down the state studying this unique ecosytem. 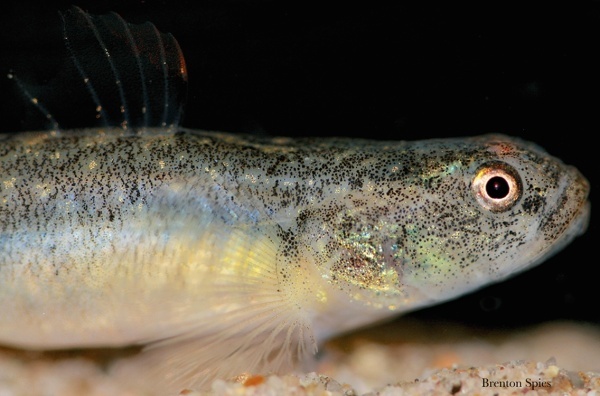 While stopping short of calling them proverbial canaries, Spies indicated that healthy populations of goby’s were consistent with and indicative of healthy wetlands. The takeaway wasn’t very heartening in some respects. 4 years of drought have really been hard on local wetlands but they are resilient systems and can bounce back as long as water conditions improve. One of the real treats at the event was a chance to see first hand the photographic documentation of California’s coastal wetlands by Brenton. A talented photographer, Spies work will be on display at the G2 Gallery through September 27th. I highly recommend you check it out. Previous Previous post: It’s World Oceans Day. Hug a Garibaldi. Next Next post: It’s Coastal Clean-up Day 2015!